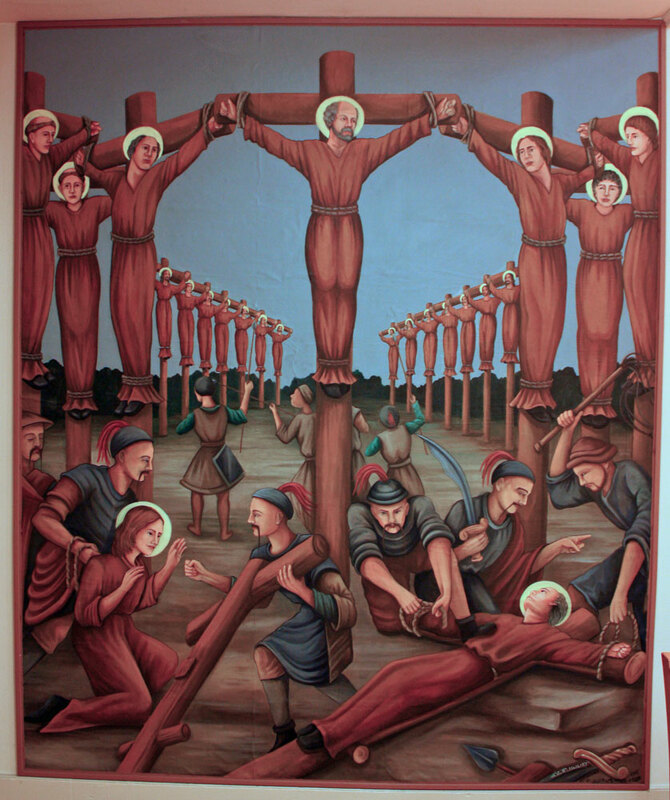 Paul Miki, a Japanese Jesuit, and his twenty five companions were martyred in Nagasaki, Japan (1597). They were the first martyrs of East Asia to be canonized. They were killed simultaneously by being raised on crosses and then stabbed with spears. Their executioners were astounded upon seeing their joy at being associated to the Passion of Christ. Every Christian is to bear witness, in life and death, to the Faith..
Below you have the 2nd reading of today’s Divine Office. Cordially inviting you to visit and like our FB page in http://www.facebook.com/CatholicsstrivingforHoliness so we can have a wider apostolic reach and thus help more people in their Christian life. Thanks! Fr. Rolly A. The crosses were set in place. Father Pasio and Father Rodriguez took turns encouraging the victims. Their steadfast behaviour was wonderful to see. The Father Bursar stood motionless, his eyes turned heavenward. Brother Martin gave thanks to God’s goodness by singing psalms. Again and again he repeated: “Into your hands, Lord, I entrust my life.” Brother Francis Branco also thanked God in a loud voice. Brother Gonsalvo in a very loud voice kept saying the Our Father and Hail Mary. Then he looked at his comrades and began to encourage them in their final struggle. Joy glowed in all their faces, and in Louis’ most of all. When a Christian in the crowd cried out to him that he would soon be in heaven, his hands, his whole body strained upward with such joy that every eye was fixed on him. Anthony, hanging at Louis’ side, looked toward heaven and called upon the holy names – “Jesus, Mary!” He began to sing a psalm: “Praise the Lord, you children!” (He learned it in catechism class in Nagasaki. They take care there to teach the children some psalms to help them learn their catechism). Others kept repeating “Jesus, Mary!” Their faces were serene. Some of them even took to urging the people standing by to live worthy Christian lives. In these and other ways they showed their readiness to die. Then, according to Japanese custom, the four executioners began to unsheathe their spears. At this dreadful sight, all the Christians cried out, “Jesus, Mary!” And the storm of anguished weeping then rose to batter the very skies. The executioners killed them one by one. One thrust of the spear, then a second blow. It was over in a very short time. ℟. We ought to boast about the cross of our Lord Jesus Christ, in whom we have our salvation, life and resurrection,* through whom we have been redeemed and saved. ℣. It has been granted to you that for the sake of Christ you should not only believe in him but also suffer for his sake,* through whom we have been redeemed and saved. Lord God, source of strength to all the saints, you called your martyrs Paul and his companions to undergo the cross that they might enter into life. Let their prayer help us to keep the faith to the end of our days. Through our Lord Jesus Christ, your Son, who lives and reigns with you and the Holy Spirit, one God, for ever and ever. POPE FRANCIS:“GOD DOES NOT DECEIVE, HOPE IN HIM DOES NOT DISAPPOINT.” LIFE IS WORTH LIVING IN HOPE BECAUSE GOD KEEPS HIS PROMISE.